In the past 12 months, we have lost two of our kitten family to Feline Infectious Peritonitis (FIP). Kenny, who was about 14 years old, and Ted E. Bear, who was a little over two. After all of the excitement in creating these pages, these losses hit kind of hard and it was difficult to get enthused about working on the web site when any of our family might be next. It's been 8 months since Teddy died, and even though we're not out of the woods, we have hope that maybe the worst is behind us. We have a new page dedicated to the memory of our lost friends that we would love for you to visit. Click here to visit the memorial page. Please! Before you leave the site today, won't you go to our guestbook and sign in? We would love to know who's been visiting Kippy and his friends! Welcome to our little spot on the Web. We're glad you've come and hope that you will enjoy your visit. 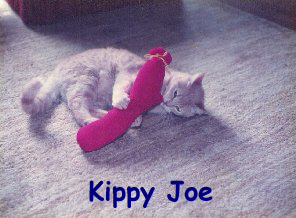 This web site is dedicated to Kippy Joe, who lived to the ripe old age of 23 and left us in the spring of 1998. We miss him terribly. We love cats and hope that this site will be a vehicle for us to share that interest with others. If you have some tips for us related to caring for cats, please write and let us know what they are. Several members of our kitten family are considered "geriatric." Caring for these older cats can sometimes be quite challenging, because they have special needs. From time to time, we will be sharing some of the information we come across that might be of interest to those of you with older cats. Be sure to check out our "Favorite Links" page for information on sites that specialize in information about older cats, and feline health issues in general. If you know of a link that we don't have listed please be sure to let us know. We would love it if you'd take a minute and sign our Guest Book! Please feel free to copy our banner and create a link back here from your web site! If you email us your banner, we'll be happy to return the favor!